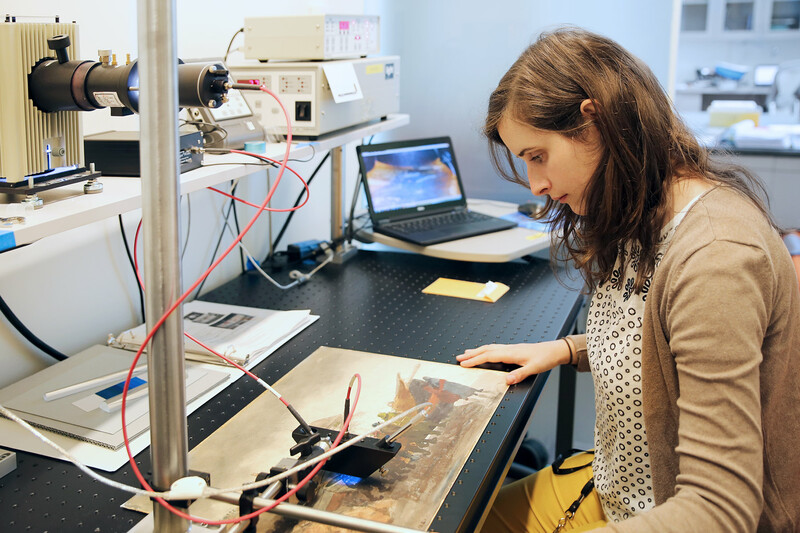 Georgina Rayner, associate conservation scientist in the Straus Center for Conservation and Technical Studies, uses a microfader to test the light sensitivity of a section of Winslow Homer’s Watching the Tempest. Just as immersing works on paper in a water bath might sound alarming, exposing light-sensitive works to light may seem counterintuitive. But sometimes that very thing is needed to carry out a complete technical analysis. Don’t worry—it’s just a test, and the beam of light used is so minimal that it’s incredibly unlikely it would cause any real problem. Our conservation staff use a piece of equipment called a microfader to measure objects’ light sensitivity, which in turn enables us to make informed decisions about when and for how long to place light-sensitive objects on view. Because light damage is cumulative and irreversible, we must be very careful to limit and monitor any light exposure to sensitive objects. The microfader essentially performs accelerated light aging tests directly on an object. An intense beam of light, less than half a millimeter wide, is focused on the surface of the object. As the light fades the surface of the object, the resulting color change is monitored by the instrument. Thanks to the microfader’s sensitivity, the experiment can be stopped before the sample location reaches a color change perceptible to the human eye. A measurement typically lasts five minutes, making it possible to test multiple points within a short timeframe. 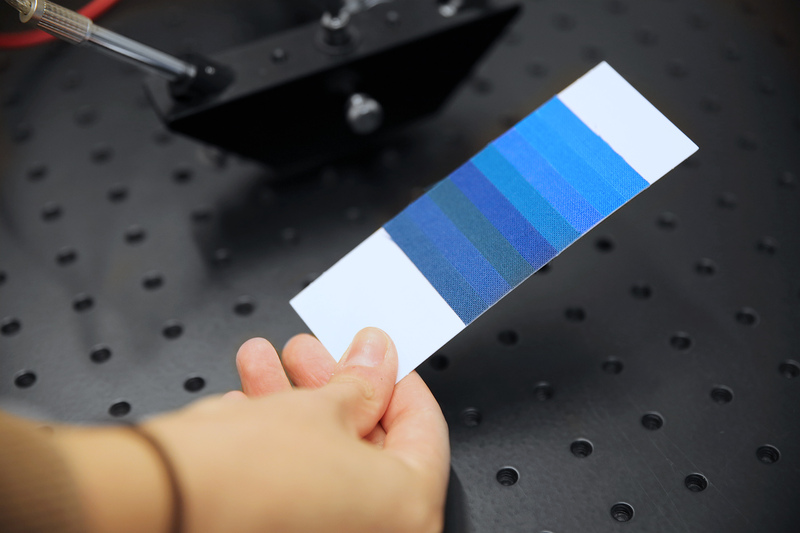 As the technique can be done directly on an object, analysis takes into account effects from all the materials in the area being tested, including the pigment or colorant, binders, and any additives present. This gives a complete picture of how that area will respond to light exposure. The technique is not limited to two-dimensional materials such as paper or paintings; three-dimensional objects may also be analyzed. The only criterion for analysis is that the area being tested is not transparent. Fading results from the object are compared to what is called the Blue Wool Standard, a card that contains eight different examples of blue-dyed wool. Each has a different sensitivity to light and therefore fades at distinct, known rates. We check our microfader results against Blue Wool Standards 1 through 3, which have the most light-sensitive dyes. An object with a pigment or colorant found to fade at a rate faster than Blue Wool 1 would need to be protected to limit exposure to light, whereas a colorant equivalent to Blue Wool 3 is ten times more light stable and at a much lower risk of fading. The eight Blue Wool Standards are available on a small card as reference for conservation scientists and others who are assessing light sensitivity. Finally, the overall results from microfader testing are compared to the museums’ light-sensitivity guidelines, which allow curators and conservators to determine specific exhibition instructions for each object, without risk of overexposure to light. Recent exhibitions that have featured light-sensitive art include Mark Rothko’s Harvard Murals and Corita Kent and the Language of Pop. 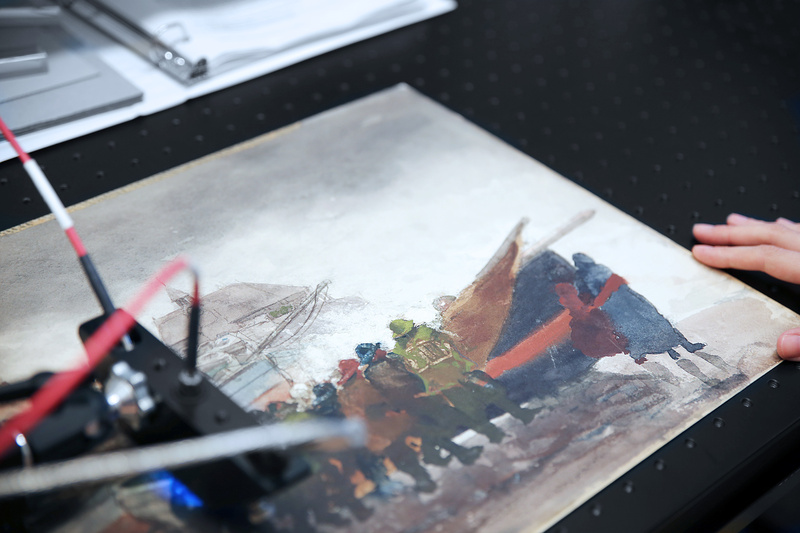 Microfading tests are currently being performed on a number of Winslow Homer’s watercolor drawings in the collections, in preparation for a 2019 exhibition tentatively titled Winslow Homer: The Eyewitness. Among the drawings most recently tested is Homer’s Watching the Tempest (1881). Analysis focused on the figures in the center of the drawing, dressed in blue, green, and red. These pigments were observed to fade at a rate approximate to Blue Wool 3 or lower—which indicates the pigments are stable enough for the drawing to be on view for the duration of the exhibition (late August 2019–early January 2020). The microfader shines a beam of light on one of the figures in Homer’s Watching the Tempest. When it comes to light-sensitive materials, the microfader helps the museums strike a balance: we can put these objects on view while also minimizing risk of light damage. And, importantly, we help ensure the works’ preservation so that future generations can enjoy them, too. 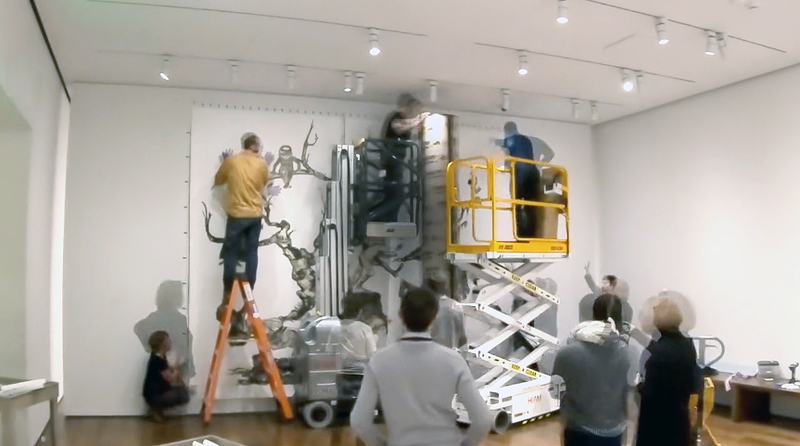 Georgina Rayner is associate conservation scientist in the Straus Center for Conservation and Technical Studies at the Harvard Art Museums. 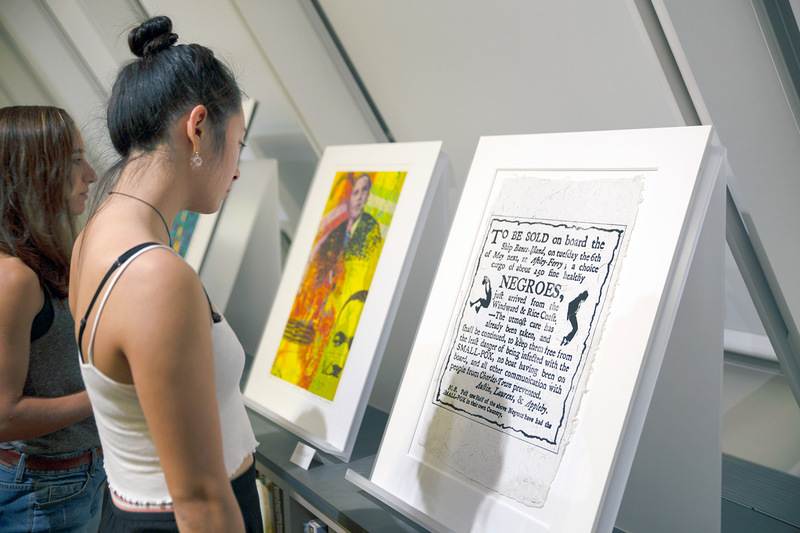 Our recently acquired prints from the Brandywine Workshop and Archives of Philadelphia have been garnering well-deserved attention.